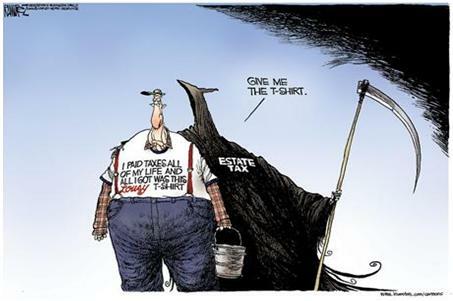 The estate tax includes exemption levels below which assets in an estate can avoid tax. In the case of a farm or business, however, the total value of the enterprise often exceeds this threshold. The estate tax applies not just to wholly owned enterprises, but even fractional ownership stakes of larger enterprises. So for example if three brothers own equal stakes in a business and one dies, his heirs will have to pay estate tax on the value of the one-third of the business he owned. Such a situation leads to an obvious problem: what if his heirs do not have enough cash to cover that estate tax? After all, the value of the company is just on paper. Should the heirs be forced to sell that one-third of the company to pay the taxes? And if so, who would buy one-third of a family-owned company, knowing that they will not have control over the business (since the other two brothers own the majority of the company)? To address this issue, the IRS allows for the value of minority stakes in businesses (like the brother’s one third) to be discounted to account for the fact that such a stake would be near impossible to sell for the full paper value. These accounting measures can substantially reduce the cost of estate taxes, allowing family-owned businesses to remain in the family rather than being sold off to cover the death tax. To the Obama administration’s IRS, however, these accounting provisions are evil. They don’t like the idea of anyone escaping the long arm of the tax man. So the IRS has proposed changing its accounting rules to severely limit the ability to discount the value of stakes in family-owned businesses. This is an assault on family-owned businesses, pure and simple. Rather than creating a system where an entrepreneur can pass on a business or farm to his children, the Obama administration wants to swing the tax hammer. They don’t care that this means that family businesses will have to be sold off; they just want more money for the federal leviathan. These rules are not yet final, they are just at the proposed stage. This means that the public still has an opportunity to weigh in with comments. You have until Nov. 2 to make your voice heard, comment now at this link.